An inspired, modern take on a classic Klismos design, this luxurious accent chair makes an excellent addition to any space from living room to boudoir. 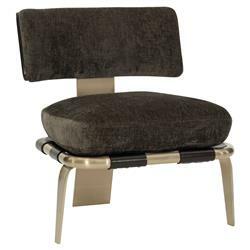 Featuring a striking, architectural frame of golden bronze metal, the chair offers a perfectly plush seat upholstered in rich, espresso chenille and supported by a base of broad, leather straps beneath. Eucalyptus wood in a luscious, aged bourbon finish brings up the rear of the chair's gently curved backrest for an added layer of texture and intrigue in this elegant, eclectic design - a masterclass in mixed materials.